Equipped with the latest dual core technology, the W5F enables users to simultaneously run demanding applications, such as running virus scan while talking on Skype and surfing the web. The W5Fâ€™s exhilarating capabilities will immerse you in riveting vibrant entertainment at home or on the go with the built-in features of your new mobile dual-core processor-based laptops. 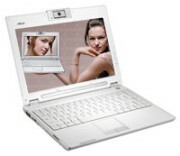 – PC Perspective – April 2006 – As far as an ultra-portable laptop goes, the Asus W5F has everything and then some — an integrated camera, a bonus Blue Tooth mouse, and even digital audio output. – CoolTechZone.com – February 2006 – As far as the notebook goes, if you can live with the black slateish and boring looks, this notebook is pretty good…..The W5F offers the latest features, plus more with Intel’s latest technology, so if that’s what you are after, make sure you give ASUS’ W5F a serious consideration. – Anandtech – January 2006 – Comparison with ASUS W5A.